"Thou art the most stubborn and ungrateful master I've ever served." Following in the magical fantasy footsteps of Bewitched (1964-1972), I Dream of Jeannie was one of the classic sitcoms of the 1960s. Perched precariously between the conservative 1950s and the sexual revolution, it was both a paragon of wish fulfillment and a product of the Cold War and the Space Race, thanks to the memorable device of making the hero an astronaut. This four-DVD set collects the first season, consisting of 30 half-hour episodes. The concept is no doubt familiar to just about everyone thanks to endless years of syndication, but briefly, in the pilot episode Captain (later Major) Anthony Nelson (Larry Hagman) is shot off in a rocket for a mission, but something goes wrong and he's forced to land on a desert isle. Instead of Gilligan and friends, he finds a bottle that contains a genie named Jeannie (Barbara Eden). She immediately falls in love, and although Nelson frees her from her servitude, she's delighted to continue in his service back at Cocoa Beach, Florida. But a genie isn't the sort of thing you can explain to the Air Force, so Tony has to keep her under wraps. When Jeannie invariably makes trouble by trying to help, base psychiatrist Dr. Alfred Bellows (Hayden Rorke) is determined to find out what secret Nelson is hiding, or go nuts himself in the process. Initially, Tony Nelson was strapped with a fiancée, Melissa (Karen Sharpe), but she and her father (Philip Ober) were briskly written out of the series and were gone by episode 4. But Melissa does serve the purpose of setting up the theme of Jeannie's sexual jealousy and possessiveness over Tony. The show was fairly radical for its time, featuring a scantily clad young woman living with a man not her husband, and certainly not in a platonic relationship. Jeannie's attempts to appeal to Tony are the focus of some good episodes, such as G.I. 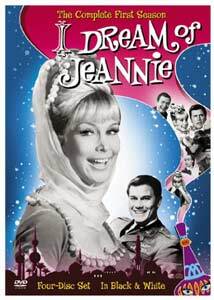 Jeannie, in which she attempts to join the WAPs in order to become Tony's secretary. In The Americanization of Jeannie, she decides to remake herself in the model of women's magazines, and soon is out of control with Tony's credit cards, among other problems, an episode sure to rankle the feminists. In Too Many Tonys, she creates a second Tony, who's eager to marry her, which understandably causes significant confusion. Unlike many sitcoms, this first season has segments that have a particular continuity. This begins with episode 12, when Tony's best friend Roger Healey (Bill Daily) goes out with Jeannie as she retaliates for an old flame of Tony's showing up. After Jeannie disappears, Roger spends the next few episodes mooning after her, until episode 17 when he learns the truth and the entire dynamic of the series shifts. At that point, Tony not only has a third person to confide in, but Roger's shallowness comes to the forefront, especially after he starts scheming how to steal Jeannie's bottle so he can control her himself. Ownership of the bottle also is critical in the clever episode Russian Roulette, where Roger unknowingly gives the bottle to a female Russian cosmonaut as a gift and she figures it out before Tony can get it back. Even in episodes that don't have a direct continuity, there are numerous references to past events, especially by Dr. Bellows as he recites the parade of weirdnesses that seem to surround Tony Nelson all of a sudden. The cast is absolutely perfect right from the beginning. Even in the pilot, Hagman and Eden have a genuine chemistry together as wel as impeccable timing. Daily, who had previously been a standup comic but hadn't acted, doesn't come into his own until the middle of the season, but once he does he has an endlessly entertaining style. Hayden Rorke usually gets stuck with a thankless straight man role, but when he gets to become more involved in the story he demonstrates comic skill of his own. That's particularly notable in Anybody Here Seen Jeannie?, where he is really amusing as he tries to make sense of the strange test results he's getting from Tony. There are plenty of good guest stars even in this first season, such as B-movie villain J. Carrol Naish, who appears as Jeannie's great-grandfather Bilejik in the episode Djinn and Water, a memorable con man with a desalinization process that Tony craves. Others who would later become more well-known include Richard Kiel (Jaws from the James Bond films), Jamie Farr (Klinger from M*A*S*H), Vic Tayback (Alice), and Judy Carne (Laugh-In). The special effects work is pretty substantial, though in a few episodes the seams show pretty badly. The double-exposure smoking bottle is effective from the beginning, though. Some of the disappearance/appearance cuts are a little ragged, while others are practically seamless. The scripts tend to be fairly crisp, though those by creator Sidney Sheldon (The Other Side of Midnight) tend to be the best ones. Although some of the trimmings take a while to fall into place, the formula of the show is immediately established and seldom varies from episode to episode. The first eight entries include a lengthy narration by Paul Frees (with the memorable line about watching as "the girl in the bottle plays 'spin the astronaut.'") After the ninth episode, the first of the series' several animated credits takes over, but the entire season lacks the familiar theme music of muted trumpets over trombones, using a much more generic theme by Richard Wess. Those who miss the standard version of the theme can get their fix from the menus, however. The programs all appear to be complete and not the cut-down syndication versions. Image Transfer Review: The full-frame picture is very attractive; the series was shot on film rather than videotape, happily, allowing for a nicely detailed picture with extensive greyscales. There's a fair amount of grain, though it isn't too sparkly and so, acceptable. The source material is in fine shape, with the exception of the stock footage, which has its share of nicks and scratches. The first season was shot in black and white, but an alternative set is available with the episodes colorized, as they appeared in syndication. Audio Transfer Review: The 2.0 mono audio sounds quite good for its period. Don't expect significant range or bass, though, since it was intended to play on 1" speakers on a fairly primitive television set. Hiss and noise are nominal, thankfully. On occasion the sound is a bit warbly, especially at the heads of reels. Extras Review: Two extras (not counting unrelated promos and trailers) are included. The first is a somewhat disappointing commentary on the pilot episode by the stars. Daily has very little to contribute, but Eden raises a couple interesting points, such as the fact she was actually speaking Farsi, and that the original costume was green rather than the familiar pink. More satisfying is the featurette Out of the Bottle (14m:23s), as the trio are interviewed about the shot, the censors, and Eden discusses the problems of filming in that costume even though she spent much of the first season pregnant! Sidney Sheldon also contributes some anecdotes about the origin of the show and its production. A blastoff from the past as the first season of this classic series hits DVD in fine fashion. Extras are a little thin but the transfer is excellent.